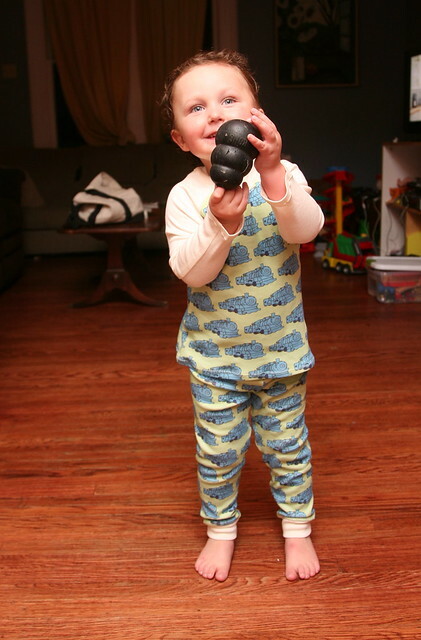 Inder Loves Folk Art: Blue Train PJs. 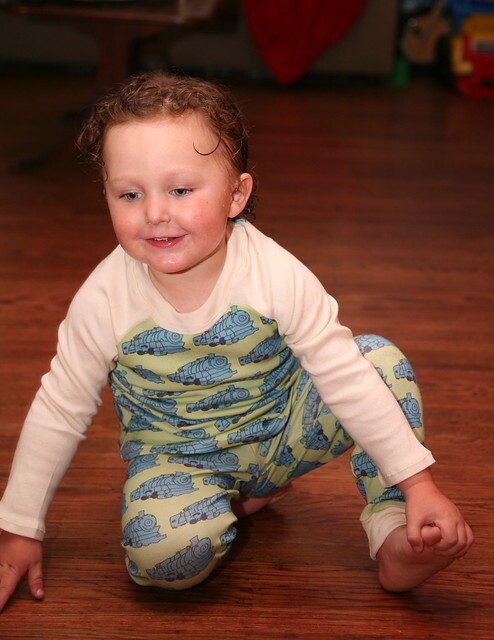 Joe needed some new pajamas, and I still had a bit of this amazing Spoonflower "Steamies" fabric leftover from Joe's Luka Hoodie. And it appears that, for once, I have made something that pleases his royal highness, Joseph Roscoe! Joe is normally a bit PJ-adverse (because you know, PJs mean bedtime, and any self-respecting nearly-three-year-old resists bedtime), but he was pretty happy to put these on tonight: major score for mama! That kind of appreciation and bedtime cooperation is enough to make this amazingly soft printed organic cotton seem almost ... affordable! Playing with the dogs' toys instead of settling down to read a bedtime story. 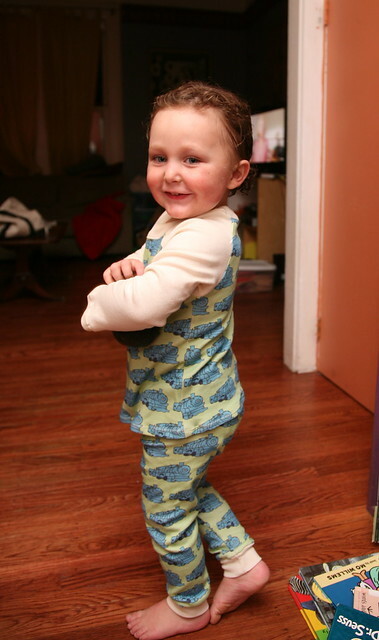 The pants are the "Sleeping Johns" from Growing Up Sew Liberated, in size 3T with a little ribbing added at the cuff. This project was especially satisfying because I used up almost every last inch of the train fabric and needed the cream knit to finish the job. Considering that Spoonflower knits, while lovely and super soft, are not by any means inexpensive, this felt as frugal as can be. I used my walking foot throughout and twin needles to finish the neckline and hems. Seriously, those two tools have just been a revelation for me. I just can't get enough of these great-looking results! The PJs pass the evening yoga test. Boom, boom, boom, Mr. Brown is a wonder! Lately, Joe has been really into Dr. Seuss, which makes this mama so happy. Who doesn't love Dr. Seuss? His books are weird enough to be entertaining even to adults who have read them a million times. Look, Daddy's taking our photograph! Nice Pj's! I Haven't used spoonflower knit yet, but I want to. 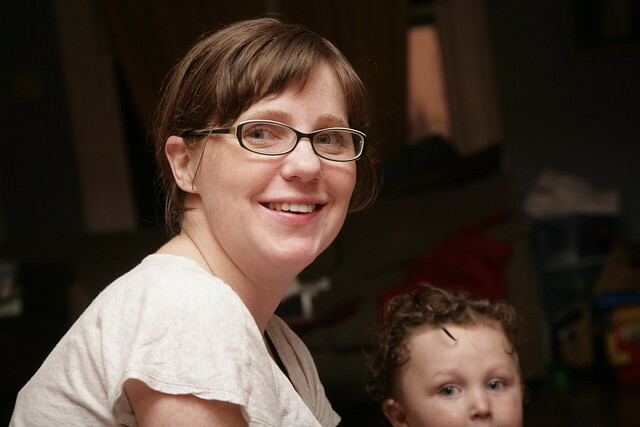 I also use/love the tee for two pattern, but my neckband always looks funky, yours looks perfect! Spoonflower knits are pricy, but very easy to sew with, and heavenly soft. Their only downside as far as I can tell is that they fade pretty badly over time in the wash. But seeing how much Joe likes these ones, I am absolutely going to buy some more. The prints are just awesome! If your issue with the neckline is that it comes out a bit stretched and ripply, using a walking foot might help cure that. That has been my experience, anyway. Those look fantastic - of course accessorised by very cute boy doesn't hurt one bit either! And he says that when he sees other prickly pear cacti (common in my part of the world) too. A literary joke! Be still my beating heart! They look great! He looks very pleased indeed. Your great results have convinced me that no knit projects are to be undertaken here without the walking foot! How did you teach Joe about the ouchy plants? We have cacti sprinkling the yard here and there but she still gets so close to them. I had to remove some spines from her leg via tweezer the other day :o No matter what i tell her she seems determined to learn the hard way! Amazing! I haven't yet ventured into the world of walking feet and twin needles, and I've only drooled over Spoonflower. But your results are very inspiring — both the jammies and those smiles! My favorite part in Hop on Pop was the titular pages, when the dad yells out, "Stop! Don't hop on Pop!" I would cover up the "don't" with my finger and jump on my dad's stomach. We both thought this was hilarious. Well, maybe I did more so! That was always my favorite part too! And sometimes I'd be jumping around on dad, and he's suddenly say, "STOP. You must not hop on pop!" And we would laugh. Good times. 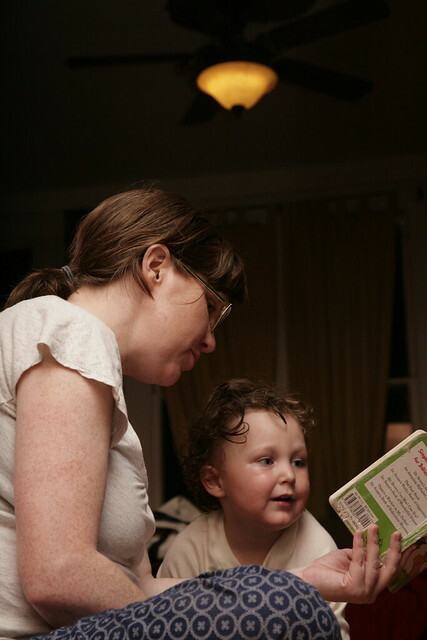 It's so fun to share a book that you have good memories of. To be totally honest, I was kind of dying of boredom reading the same truck books over and over. I'm so happy for a change! It took me a long while to get around to trying it, just because the needles are expensive and I couldn't quite wrap my head around how it would all work. But it's one of those things - pretty easy once you try it out. I'm not soliciting Joe's help in picking out his next Spoonflower fabric. Helicopters, yellow tractors, or fire trucks? He hasn't decided yet. Wow, these would have to be the most groovy pjs I've seen, Inder - fabulous!